1. Don’t make things happen. Rather than forming an opinion and then trying to prove it, documentary filmmakers shoot first and organize later. 2. The script comes last. Any narration is based on the footage, as is the structure of the film. Documentaries are made in the editing room. 3. Don’t mess with the timeline. With the exception of interviews, events are shown in the order of occurrence. 4. No pictures, no story. All narration must be illustrated by images, preferably moving images, followed by still photos and illustrations. Re-enactments, if any, are a last resort. Because I’ve followed these rules in all my documentaries, I’ve had to make hard choices, particularly where images are concerned. When Jim Thompson’s heir failed to follow through on his promise to let me use family photographs, I had to cut short the section on Jim’s youth. Later, a total lack of photographs of Peter the Hermit, the original Hollywood costumed character, led me to drop his story from “Under the Hollywood Sign.” In the same film, I reluctantly made a re-enactment of Peg Entwistle’s final hour because I lacked photos and artifacts. In both Peter and Peg’s cases, I later received a flood of photographs and information, some of which can be found on this blog, but in Peter’s case it came too late to be included in the film. While I don’t regret my strict approach, it doesn’t jibe with recent trends. The preferred model for new documentaries is the three-act screenplay, which requires a dramatic arc. Stories unfold like police procedurals, with satisfactory conclusions, while unrecorded events are generously re-enacted, often in lurid slow-motion. All of this makes for compelling entertainment, but is it real? 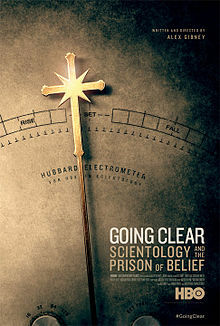 Alex Gibney’s “Going Clear: Scientology and the Prison of Belief,” is a good example of the new approach. Essentially a filmed version of Lawrence Wright’s book of the same name, the film employs traditional elements–interviews, archival footage, B-roll of Scientology landmarks. But it is also loaded with re-enactments that tell L. Ron Hubbard’s story and those of his disaffected followers. So we see recreated auditing sessions using the E-Meter, typewriters, explanatory charts and lots and lots of stars (the planetary kind, though there are archivals of John Travolta and Tom Cruise as well). Absolutely nothing is left to the viewer’s imagination. To illustrate his subjects’ retelling of Scientology’s creation myth, Gibney creates a colorful montage of 1950s Americana, spaceships, volcanoes and planets. And in case the term “Operating Thetan” proves too difficult to comprehend, he inserts a shot the words, neatly typed, on a piece of paper. The paper is still in the typewriter, one of many such shots, lest we forget that L. Ron Hubbard was a writer. You are currently reading The New Documentary, Part I: “Going Clear” at Under the Hollywood Sign.